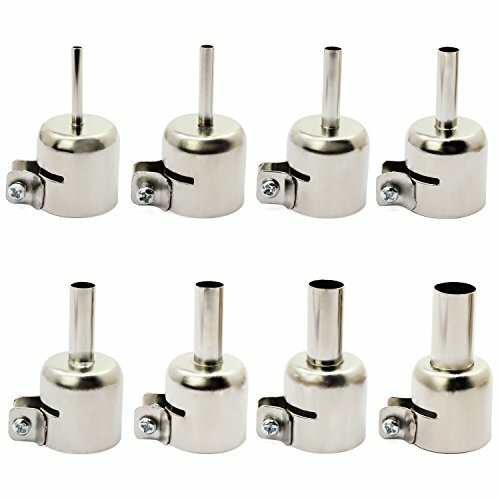 8 different sizes you will get in this nozzles set. Locking screws furrowed live wind mouth. Effective way to avoid the hot air gap between the outlet steel pipe to drain from the air nozzle with hot air gun. Easy to replace, versatility, high-quality stainless steel, durable. High quality 3-12mm universal heat gun nozzle hot sir gun heat resisting nozzles tips tool. With the lock screw which can lock the nozzle firmly,effectively avoid hot air flow out from the gap between the nozzle and the heat gun air outlet steel pipe. Compatible for 850 850A 852 852D 852D+ and air pump type hot air soldering station. Suitable for many kinds of hot air soldering station, exquisite workmanship, with long service life. 8pcs/set, include size: 3mm, 4mm, 5mm, 6mm, 7mm, 8mm, 10mm, 12mm.